Don’t you hate those days where the office is hotter than the Human Torch and the A.C doesn’t seem to give a damn – let alone when the night doesn’t help drop the temperature any? Living in a beach city well into ‘summer temperature meltdown’ mode, a splash in the ocean is one of the only true escapes currently available. In doing just that recently I clicked IADW has never had an obligatory swimsuit post - that my friends has to change. 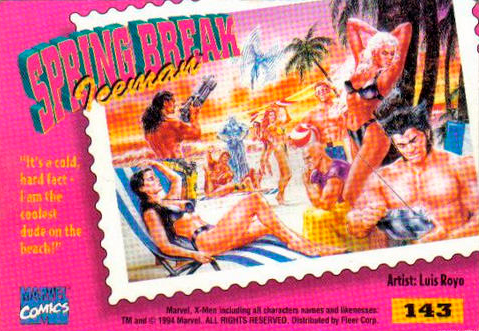 Sure half the globe is on the flipside of the clock at the moment and the last thing they want to think of is swimsuits and cooling down, but when we are talking the Spring Break paintings from the Marvel '95 Fleer Ultra X-Men trading card series, I’m sure even Santa Claus, at the heart of the frigid North Pole, would find something within these masterpieces to warm his bones. (Click to zoom in). Rendered by legendary fantasy painter Luis Royo, the nine cards of this sizzling subset featured Sports Illustrated-ish numbers of Marvel’s merry mutants, complete with a character related comment on the back. The quip that stuck in my mind the most was from Cyclops on the reverse of Scott and Jean's card; “Quick! Jean! Danger Room sequence M45!" I mean if you're talkin shop at the beach you need some serious help. 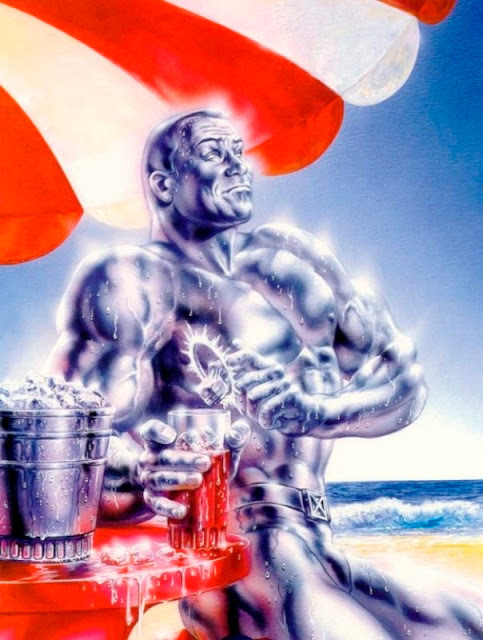 This image of Iceman my favourite of the team's founding member. I mean if you could make ice for your Sprite or brewski at a moments notice, don't tell me that wouldn't be cool. The detail on that ice bucket! Rogue, the southern belle she is, steals away with two appearances, though I wish it was Jean that had slipped the second. 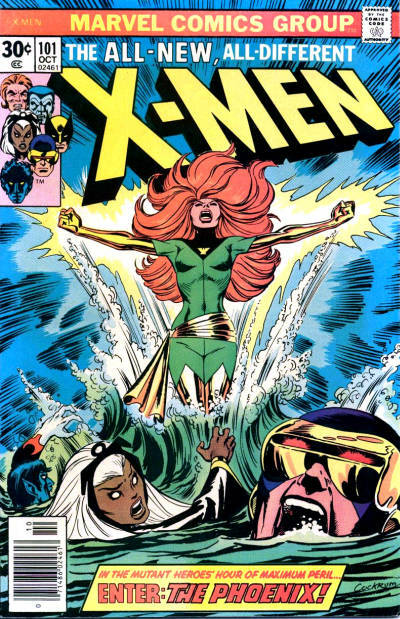 Imagine Luis’ talented brushstrokes tackling Phoenix rising out of the ocean in a tribute to the cover of Uncanny X-Men #101. Not complainin’ of course just sayin’. I don't think I do have them, but I do remember them, especially the one of Logan with the hotdog on his claw. Fantastic work! I knew some of the works of Royo, but I didn't know these works made for X-Men. "The detail on that ice bucket!" LOL TomO I didn't even think of well that. I think there needs to be another level of 'proof reading' on my posts from now on! João, Craig and Jonny glad you liked the cards! When all my mates were collecting Ultra 95 X-Men's I was doing Spider-Man's series, but this subset seemed pretty fun, so I'd swap doubles of cards with Venom in for these. Funny, we were cleaning house and I found all my cards (and doubles). never been a big Royo fan. i don't like his use of color. it's as if everything has a glare coming off it. i find it distracting. He was a victim of the late '80's/early '90's penchant for trying to find a use for airbrushed effects in any and every piece of artwork. Thanks for the coments folks!